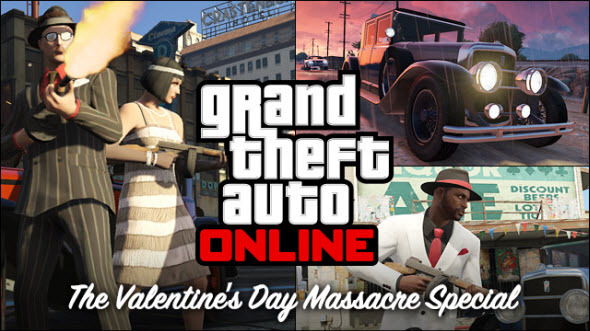 The most romantic holiday is on this Friday, and if you don't have any ideas how to spend it, then you can try the new GTA Online update, which will be released on the 14th of February. About an hour ago the developers announced its launch and presented the pack's content. As you may already have guessed, the GTA Online update will feature several interesting and useful in-game items that are Valentine's themed. The developers are sure that nothing can warm your heart like a new gun - Gusenberg Sweeper - that will be added to the game. And if you want to show your new weapon to the whole city, you can choose the fresh car - Albany Roosevelt. It is perfect for gangsters and their girlfriends and allows your band to drive along the streets and shoot everyone around you. To finish your new image, you need a nice suit, and that's why fresh GTA Online update will also include several beautiful dresses that were stylish in 1920s. And after you get dressed, you should try several new jobs that will be added with the GTA Online update. Alongside with the deathmatches, here you will find several land and sea races and even a skydiving. If you are going to spend the holiday together with your special someone, then we would like to advise you our article about the most romantic gifts for gamer. However, you should find a couple of minutes for the GTA Online update, because all this content will be available only for a limited time, but once you have added some item to your inventory, it will stay there forever.